Let’s do recovery for New Year’s Gifts and Resolutions! Give to yourself and others you care about. We want you to join us in 2013! This is the time to kick-start your own recovery work and continue the five-step program by signing up for the online workshop designed especially for you. 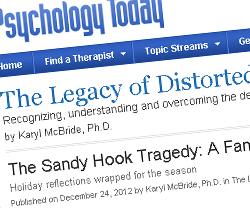 We will be discussing recovery steps on Facebook in 2013 with Dr. McBride. We have offered a discount of $129.00 so more of you can jump on board. "When I purchased Dr. McBride's virtual workshop I only had a vague idea of what to expect. This was such a new therapeutic concept, but the availability and flexibility it offered was appealing to me. After purchasing it the link arrived immediately via email. And upon opening it up I was pleasantly surprised. Immediately I could tell how well thought out and organized the program was. The information was all in one place. There is no downloading, hopping around the Internet or navigating link after link to get additional or pertinent information. Everything you need is on one page and very easy to access. The sessions are presented exactly as you would expect if you were physically attending a workshop but better! This is because you have the option to stop, start, rewind the video and take notes. The length of the video sessions range from eight minutes to 20 minutes and include downloadable and printable worksheets that outline the exercises to complete before you move on to the next session. which alleviates the stress you may be experiencing from keeping those memories current, alive and unresolved. Journaling allows you to move forward in the healing process. If you tried to get through this workshop without journaling, it wouldn't work. It's the tool that "cleans the house" at the conscious and subconscious level. You can't move forward until you make room. Additionally, journaling has released suppressed memories that I wouldn't have discovered otherwise. It's amazing what your mind reveals to you when you "take out the garbage". Some of the journaling exercises opened up a plethora of unresolved loathing and anger I harbored unwittingly. To make these discoveries has propelled my healing process because "you don't know what you don't know". And I would have stayed in the dark had I not found the key that unlocked the door. Currently, I'm a little more than halfway through the workshop. I've lowered the anchor in order to spend more time on certain exercises and work through some stuff that's clearly at the control center of my NPD abusive experience. But I feel amazing! I still have a way to go before I morph from "survivor" to "thriver", but the difference is I can see the light at the end of the tunnel. And it has never been a more welcome sight! 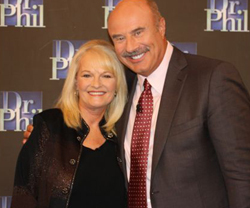 Dr. Karyl’s fall appearance on the Dr. Phil Show where he so kindly endorsed her book; Will I Ever Be Good Enough? and did an important show on maternal narcissism. Many of you know that Will I Ever Be Good Enough? Healing the Daughters of Narcissistic Mothers has been translated into Chinese, Korean, Japanese and Finnish. We are pleased to announce that the Spanish translation is now in progress and will be out in 2014! Dr. McBride and her team send each and every one of you special holiday wishes with big hopes and dreams for a wonderful 2013! As we recover together, we will take each step stronger and make a difference for our generation and those to come. We can stop the legacy of distorted love one step at a time.